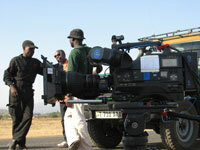 African Environments has been providing outfitting for film crews for more than 16 years. Now, with Janice Beatty as a company Director and film fixer, African Environments is the leading film outfitter in Tanzania. We can supply you with a wide variety of services that will meet the needs of your film crew and budget. Luxury Camps set up in remote areas can be staffed and supplied from our base in Arusha for short shoots, or for months on end. See Luxury Camps for a full description of what this camp is like. If you are interested in a lighter camp that can be moved quickly we can supply our Wilderness Camp, a full description is under Wilderness Camps. Communication between the camps and our base in Arusha is usually by High Frequency radios which are monitored 7 days a week. The is used by the camp manager to arrange additional supplies but also for the film crew themselves to communicate directly with us to receive updates rushes / dailes reports or other messages from abroad. We have a full staff in our Arusha headquarters that can meet your needs, whatever they may be. Vehicles can be either the traditional four wheel drive safari vehicles with roof hatches, or if you need a special camera car for filming ‘off road' we have 4 WD Land Rovers that can be modified to meet your filming specifications. We have converted vehicles for a number of film crews over the years and have a number of ‘ready to go' camera car layouts. If you have specific requirements our fully equipped workshop can work with you to modify the vehicle. Our drivers are amongst the most experienced at working with film crews and they are all fluent in English as well as Swahili and often another tribal language. Driving a camera car is very different to driving a normal tourist vehicle. The driver needs an awareness of the camera angles and to be able to react fast, anticipating the cameraman's instructions. Our drivers are also used to the 'unusual' demands of film crews, from driving off road around the Serengeti at night with infra red goggles strapped to their faces to persuading a group of villagers not to kill a snake because it is being filmed!. We also have a variety of ancillary equipment available for hire from aerial mounts to generators for charging batteries in remote locations. We have two types of generator: 650w 'man portable' generators idea for charging batteries and running ancillary equipment in isolated areas. We also work closely with Gary Matthews at www.gpmfreight.com. This company specialise in shipping film equipment and they have a lot of experience bringing film equipment to Tanzania for us.